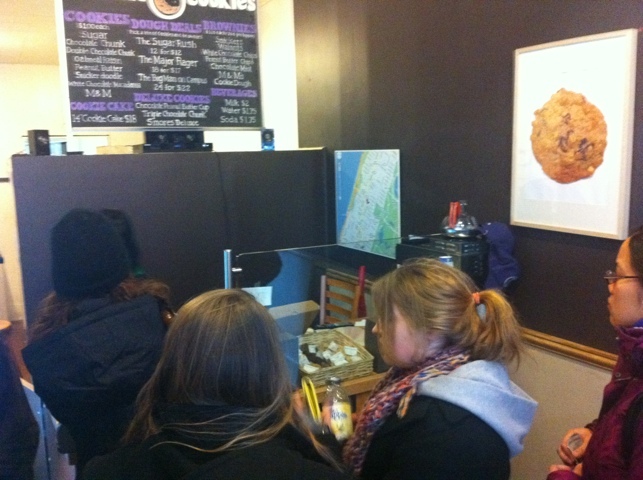 Insomnia Cookies. Next Time I’ll Sleep In. The storefront. 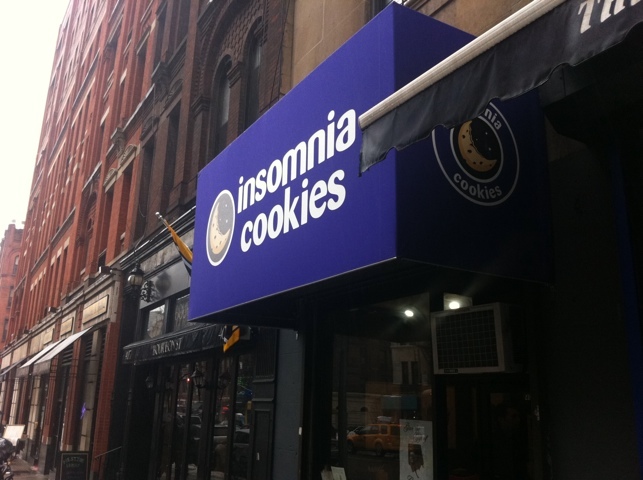 A promising name, I'll grant you... .
After leaving the wonderful Luke’s Lobster recently, I noticed a new shop caddy corner to it: Insomnia Cookies. Of course, it was necessary to try it. I wish I could say I was pleased. Alas, I was not. Ok, I get it, the whole business model is apparently dedicated to catering to college stoners at 2 am (hence their name).Unfortunately , for the more sober amongst us, the result is much less impressive. That crappy little boom box should not be cranked up. No. First of all, there was the noise factor. Like most Americans, I am impressed with (and broadly a fan of) Usher. However, I am not a fan if being subjected to blaringly loud remixes of his vocal stylings when I walk into a cookie shop and am made to stand on line for a damn cookie. Turn the music down a bit, please, your storefront does not have club-like speaker systems, no matter how high you turn up your crappy boom box. The selection. Looks promising as well. How could this go wrong? However, I will put up with all sort of difficulty for good food. Alas, the cookie disappointed. Let’s start with what was good. The cookies were warm, which is very nice. They were a decent size. They seemed fresh. All good. Best gimmick of all: late-night delivery. I guess they know their target audience. 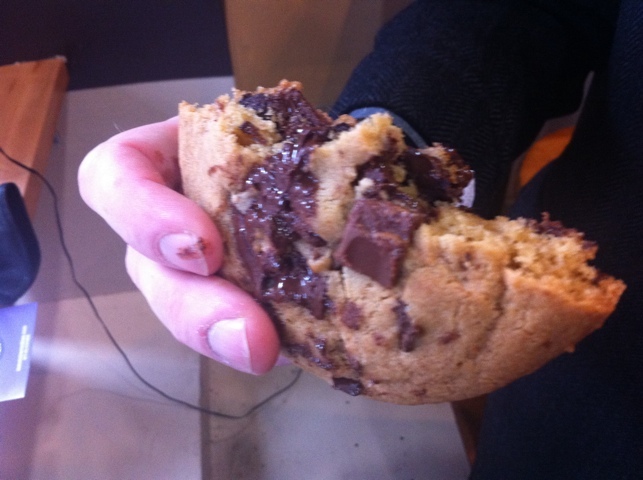 The chocolate chunk was gooey enough to spread onto fingertips. However, they went wrong at the flavor. They had a pectin, artificial note to them. Perhaps they were oversaturated with brown sugar, I am not sure. All I know is that they were not full of cookie goodness. They were pleasantly warm and gooey, but just not fresh and cookie enough. 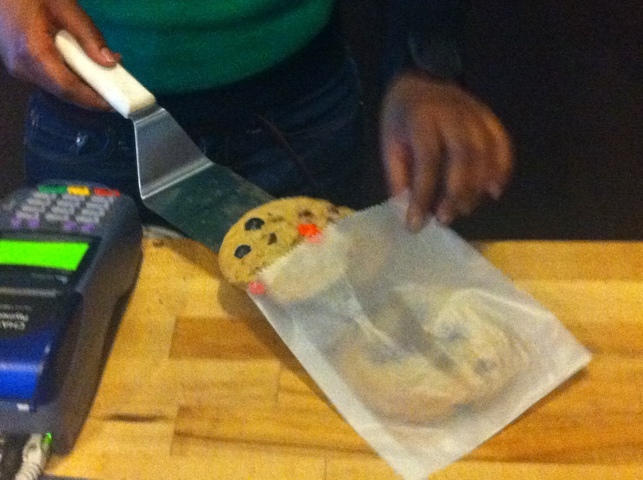 Granted, I am probably being unreasonably harsh, as their cookies clock in at $1 each, which is a pretty good deal. 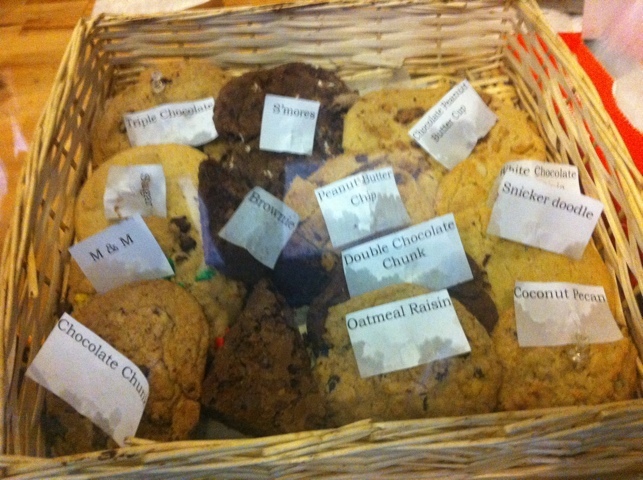 That said, I’ll go elsewhere for my specialty cookie fix. I hope to be able to give you a few suggestions as to where, exactly, soon.